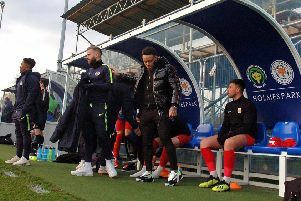 Holwell Sports manager Simon Daws has admitted he faces the toughest challenge of his career after five players left the out-of-luck club last week. A first team squad decimated by injuries, which had lost nine of their previous 10 matches, will now have to do without its spine as Holwell fight to avoid dropping out of the East Midlands Counties League. Centre-half and stand-in skipper Aaron Ridout, left-back Liam Chapman and midfielder Chris Hibbitt have all opted for a higher league challenge with Kirby Muxloe. The talented trio left before Saturday’s home clash with EMCL leaders Ashby Ivanhoe and were joined through the exit door by right-back Kieran Foster and defender Stuart Rose who have gone to cross-town rivals Melton Mowbray FC. But Daws was magnanimous about the departures of players who had come through the Holwell youth system before serving the first team. “I am disappointed to lose them, but I am never going to stand in anyone’s way who wants to play at a higher level,” he said. “As a football coach you want to see your players doing well and going higher, but I’m just a bit disappointed that all they could do was text me instead of talking to me. But I think that is the way of the world now. “I have wished them all good luck and hope they manage to play at the next level, but I have to concentrate on Holwell and getting together a side that’s going to keep us in the league. Daws’ makeshift squad - which included four players under the age of 20 - earned credit for their display in a 3-0 defeat to Ashby, a scoreline which flattered the league leaders. The Asfordby Hill club have been boosted by the return of playmaker and skipper Michael Stevenson from a long injury lay-off, as well as centre-back Joe Hallam for Saturday’s tough trip to title-chasing St Andrew’s. He added: “We had a good, sharp training session last night (Tuesday) and everyone was on it. The Saints have a 100 per cent home record in the league this season and have won eight of their last nine league fixtures. But Daws believes his side would have gone into the match as genuine title rivals with better luck. Their exciting run in the FA Cup - in which they ousted Kirby Muxloe - proved a mixed blessing. The extra fixtures exacerbated injury problems into a full-blown crisis, and also alerted Kirby to the qualities of Hibbitt, Holwell’s player of the season in 2014/15, Ridout and Chapman. “I believe the side we started the season with could have won the league and when I spoke to the Kirby Muxloe manager last night he said the same thing,” Daws said. “We were flying high in the FA Cup, but then the niggles turned into big injuries because we didn’t have time to rest anyone. “Then things don’t go your way and you find out what your players are made of, and some of them throw the towel in and go.